Presentation -- B: The dust cover is gorgeous. 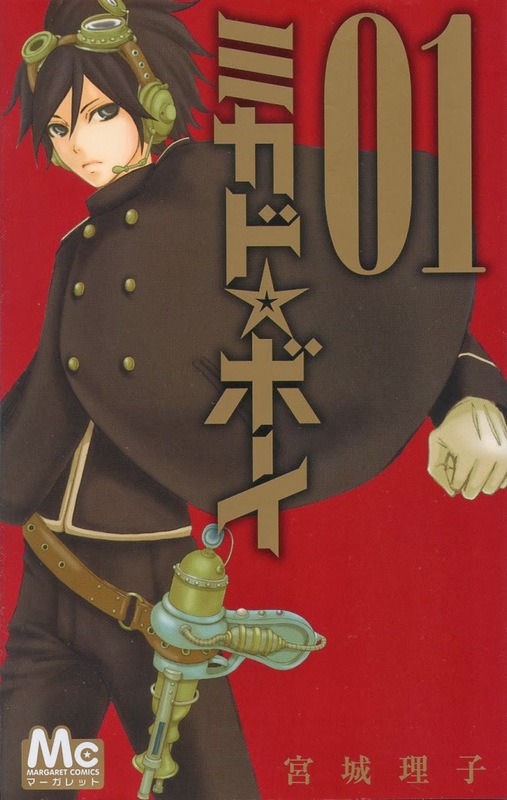 I love the simple red background and steam punk atmosphere of Hide's uniform. There are no color pages, but there are some informative and entertaining extra's between the chapters. The main annoyance about the presentation for me is the mangaka's tiny handwritten chicken scratch. Because the book is so small, I had to pull out a magnifier to read some it. Also, there are some pages that are so cluttered with text, that it becomes overwhelming to look at. Story -- A-: I'm a sucker for anything with spies, so I was very pleased to discover that this is a spy series. The first chapter is a little hard to get through in the expository sections. For some reason the mangaka felt the need to explain the school system from elementary school to university... ugh... And then there are random unnecessarily detailed explanations of characters and their situation. On the flip side, this style of explanation came in handy when the details of the case were explained. The story itself is nothing original, but it is well told. And because the story behind the first case was made very personal by humanizing Congressman Hamada's son, the truth of the situation and impact of the case are deeply felt. Actually, I should point out how rather amazingly well the emotional tie and the consequences of the case were constructed. Yes, we're happy the truth was exposed, but at the same time the reader feels the conflict that Hide feels about the ultimate outcome of unearthing the truth. Did Hide do the right thing? But more importantly, was there another way? And is there something coming back to bite Hide and Gin as a result? A more shallow approach would have simply declared the day saved and then moved on to the next case. This first volume has a good mix of action and heart. I like the character building through everyday interactions between Hideto and Hamada, and the juxtaposition of Hideto's thoughtfulness and Gin's seeming recklessness. I'm interested in seeing Hideto's growth as a character in the next volume, and I want to learn more about Gin. Overall -- A-: Despite the minor presentation quibbles, I really enjoyed the first volume. I loved the action, the political intrigue, and the establishment of boyhood friendships. I would love to see something like this licensed so more readers can experience the breadth of shoujo content. I greatly look forward to reading the second volume!